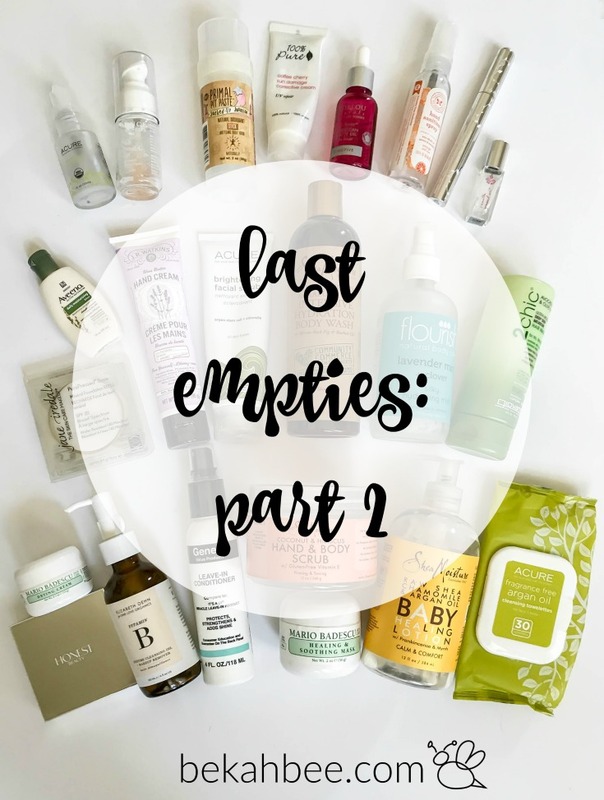 It’s time for the second part of my last beauty and body product empties post! I have decided to replace these types of posts with Monthly Favorites instead. 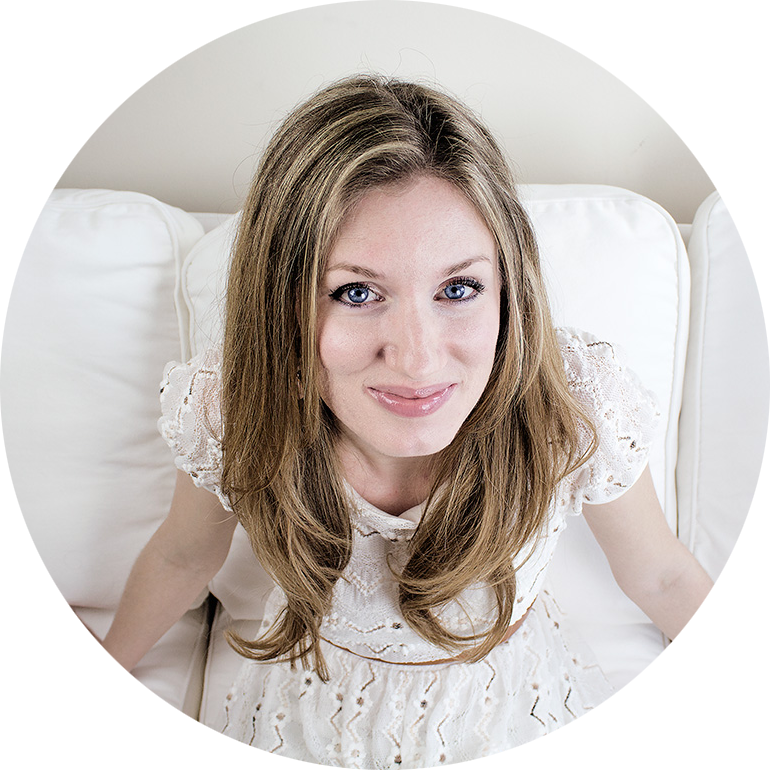 I am excited to start bringing you all my favorite products I am loving each month. I am thinking it will include not just beauty products, but also lifestyle faves. Can’t wait! 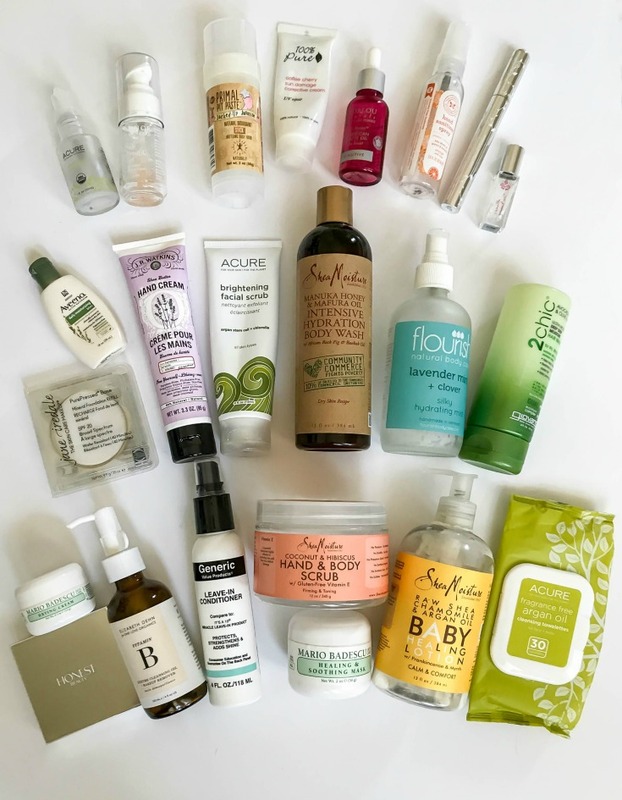 Here is the last round up of all the empties I have been collecting for quite a while! Life got a bit crazy when we moved to our new house, so it got kind of put on hold for a while. Here you go! Acure Argan Oil: Tried and true fave, I will always have this on hand. Great for my face and I use just a few drops on the ends of my hair as a defrizzer. Eminence Organics Pink Grapefruit C-Gel: This gel moisturizer was very interesting! I got it after falling in love with a sample. I thought it was really light feeling and the grapefruit & mint is was super refreshing! The only con is it retails for $58! (I got it with a discount) And for such a small amount, it is just hard for me to justify for a daily moisturizer. It was especially nice in the summer under makeup. Primal Pit Paste Deodorant in Jasmine: I think I got this one because they were out of the Lavender scent at whole foods. I like it as well, very nice and floral. 100 Percent Pure Coffee Cherry Sun Damage Corrective Cream: Why do people always stop making things when people love them?? I’ll never understand, boo! So this moisturizer lasted quite a long time, and I had no complaints. I liked it a lot, it wasn’t greasy and smells like coffee/cupcakes. But alas, it has been discontinued. Oh well, I am looking for a new fave moisturizer now! Andalou Naturals 1000 Roses Moroccan Beauty Oil: I tried a sample pack of products from this rose line for sensitive skin, and while it didn’t aggravate my sensitive skin, it didn’t really DO much for it either. I found this too light to use as a face oil and finished it up by using a couple drops of it on my hair as a defrizzer. It worked great for that and smelled really nice. The Honest Co Hand Sanitizer Spray in Orange scent: Loved having this on hand, but I discovered they have a lavender scented one so I prefer that one now. 100 Percent Pure Ultra Lengthening Mascara in Black Tea: I am torn on this one, I think I would need to try another tube of it to know for sure. This was the first natural mascara I tried and I loved it so much and was so impressed by its performance! But I recently replaced it, and the new tube I got just doesn’t wow me anymore and seems somehow clumpier..or something? Perhaps it is old or a fluke, but now I don’t know if the first one was normal that I loved, or if this one I don’t is. I may try Lily Lolo next too since many people swear that is their holy grail natural mascara. Lavanilla Mini Roller Ball Perfume in Vanilla Grapefruit: My fave scent of the roller ball sizes I got, it smells delicious! It is very happy, fresh and just like the name suggests. I used it up first and still have yet to finish the others, although I love the other smells too. Will probably get the full size eventually! Jane Iredale PurePressed Base in Bisque: I used this as a powder over my foundation, to add extra coverage and blur the look of imperfections. It worked really well for that! Although, I still needed to set with a matte powder on top, since it is not very matte. A bit glowy, I would say. Aveeno Daily Moisturizing Lotion travel size: This lotion scores pretty low on EWG, and I always go back to it when I can’t find a natural one when I need one. I like it a lot, and it works great. Acure Brightening Facial Scrub: I have bought this face wash for my husband for quite a while. He liked it enough for a while, but I may try something new soon. He doesn’t love how messy it is. When I used it I did like it, but I suggest using it in the shower since it is quite messy and green! Shea Moisture Manuka Honey & Mafura Oil Body Wash: I was trying to find a Shea Moisture scent that didn’t use coconut oil in it, and I found this one. I was also trying to clear up some body acne and figured the honey would be helpful for that. I liked it quite a bit and I think it did help with that. It’s not my favorite smell, but also not bad. Flourish Lavender Mint + Clover Silky Hydrating Mist: I think this small company is really cool and would consider trying some of their other products, but this was just not moisturizing enough for my hair as a leave in conditioner. Too light. 2Chic Avacado & Olive Oil Deep Deep Moisture Hair Mask: This deep conditioner was pretty much just okay for me. It wasn’t terrible but also not something I would repurchase. Mario Badescu Drying Cream: The hubs and I always have to have this on hand for any breakouts. I have yet to find anything that works as well as this as an overnight acne treatment! Not the most natural, but I can’t live without it! Honest Beauty Cream Foundation: This foundation WAS my fave for a while when I was using it over the Pink Grapefruit C-gel I mentioned above. It has pretty impressive coverage. But I have since been spoiled by the Gressa Foundation and like that much more! One Love Organics Vitamin B Cleansing Oil & Makeup Removal: LOVE this stuff, it is awesome! Very unique product. It is an oil makeup remover/face wash but it rinses off clean without any oily residue like the traditional oil cleansing method. It smells delicious and tropical, like pineapple. It really gets your skin nice and clean from all your makeup. I enjoyed using it the most as the first step of a double cleansing routine, this first to remove makeup and then a foaming cleanser just to make sure every trace is gone to keep my pores clear. This is a cult classic in green beauty for a reason! It also feels so nice and silky as you are massaging it into your skin. GVP Leave in Conditioner: The toughest thing for me to replace has been hair products that actually moisturize my hair, and style it without frizz. I gave up for a while and just went back to conventional styling products until I find some natural ones that are super effective. This is the Sally beauty version of “It’s a 10 leave in product” which I always used to like. I will say that going back to conventional hair products, I can tell now how strongly they are scented and this almost gives me a headache with the smell. But it does work well. I am going to try the EVOLVh hair line in the future since people say it compares to salon products, while still being natural. Sounds great to me! Anyone have any experience with this line? Shea Moisture Hand & Body Scrub: I really love this scrub, it smells delicious and is great for using as an exfoliator on your legs prior to shaving! Only con is the shower floor gets slippery after using this, from the oils. Mario Badescu Healing & Soothing Mask: This is not a fully clean brand, but I keep going back to it for certain products until I find satisfactory clean replacements. This line is really effective, with fewer “bad” things in it than others. I got this mask when my skin was highly agitated and I needed something serious to calm it down. I had tried a sample before and it was really effective! It smells kind of “yeast-y”, like bread sort of. I finished the whole thing and it worked very well, while I researched which clean lines would help calm my highly problematic skin in the future when it breaks out. I got May Lindstrom’s “Problem Solver” mask for this purpose and it is really effective! Full product review on her line coming soon! Shea Moisture Chamomile & Argan Oil Baby Healing Lotion: I got this to use as a hand lotion, and it was very nice. Acure Fragrance-Free Argan Oil Cleansing Towelettes: These were my favorite facial cleansing wipes until I found the Shea Moisture Rose ones. Although I really like these Acure ones, and my skin did really well with them, they did sting my eyes just a bit and the Shea Moisture Rose ones do not. This entry was posted in Beauty on 09/15/2017 by bekah.